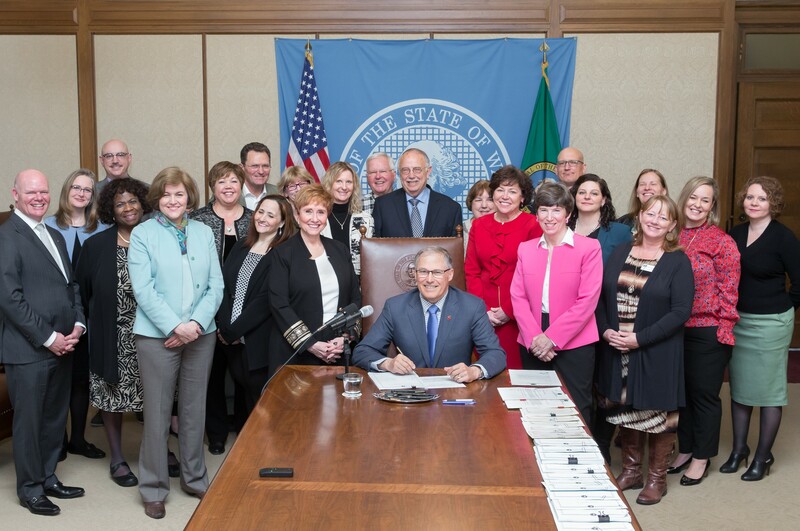 WLA actively pursues a legislative agenda that presents the interests of its members through a legislative planning committee and a contract government relationship representative who works with the Washington State Legislature. WLA's lobbyist is Carolyn Logue. The session started out quickly with legislators passing a fix to the Hirst Supreme Court decision dealing with water rights that led to the passage of a Capital budget – both of these issues were leftover from the last legislative session. Then they settled down to work on a supplemental operating budget. Has an additional $1.2 billion in revenue from higher than expected revenue forecasts. $22 million from the Budget Stabilization Account is spent on fire related costs. Has a proposed ending fund balance in 2017/19 of $1.2 billion with $2.4 billion in reserves. The 2019/21 budget has a projected ending fund balance of $103 million with $1.8 billion in reserves. $250,000 is appropriated for the Secretary of State’s office to hire two staff people to digitize state library materials for wider accessibility and to further develop the online teacher portal. $80,000 was appropriated to facilitate a capital needs assessment study of public libraries in distressed counties – including the library facility backlogs and local funding capacities for both non-historic and historic libraries. $900,000 is appropriated from to enable more student access to digital learning through the e-rate program. On the policy side, WLA had some key victories but also lost a couple bills due to the fast time frame and the fact that more time was needed to complete the work. Increasing Broadband Access (SB 5935): This bill would have set up an Office of Broadband Access and provided funding for broadband improvements throughout the state. Although WLA was able to amend the bill to ensure participation in the Office of Broadband Access and the needs assessments by the Washington State Librarian, the bill was not able to be brought to the floor for a vote prior to the end of session due to disagreements about some of the technical issues with broadband. WLA will be working on this over the interim and will be back next year to get this bill passed. School Library Bills (SB 6140/HB 2695): These bills would have created a three-pronged approach for school library support. They would have given “library materials” its own line item in the prototype school allocations, required OSPI to study what is happening with school libraries across the state, and added a school library oversight position at OSPI. While neither of these bills made it past the cutoff dates, WLA was able to amend the “library materials” change onto SB 6362 (see below). Service Animal Misrepresentation (HB 2822): This bill clarifies the definition of “service animal” for all public accommodations (including libraries) to match the federal definition of a dog (or miniature horse) that is specifically trained to do a task for a person with a physical, psychiatric, mental, or sensory disability. It then makes it illegal for a person to misrepresent their animal as a service animal and allows law enforcement to cite a person who is doing this. The bill, which was drafted by the Governor’s Office for Disability Rights and the Human Rights Commission, passed both houses with overwhelming support and is now on the Governor’s desk. The hope for this bill is that it will make people think twice before bringing their untrained pet into a public place and will also provide more protection for those who do have trained service animals in the disabled community. Expanded Learning Council (HB 2802): WLA was very disappointed to see this bill die in the Senate Early Learning & K12 Education Committee. The bill would have made permanent the existing Expanded Learning Council (which has a WLA serving on it). This council is important to coordinating efforts between early learning, K-12 education and summer learning programs. The proponents, including WLA, plan to work over the summer and bring this bill back next year. Student Freedom of Expression (SB 5064): This bill, which passed and is now on the Governor’s desk awaiting his signature, offers protection to student media at both public high schools and higher education institutions. School officials may only prohibit student media that is: libelous or slanderous; an unwarranted invasion of privacy; obscene or indecent under the Federal Communications Act; violates school district policy or procedure related to harassment, intimidation, bullying, or discrimination; incites students to commit an unlawful act on school premises or violate a lawful school regulation; or creates a material and substantial disruption of the orderly operation of the school. Political expression by students in school-sponsored media may not be deemed use of public funds for political purposes and student media advisors are also protected from repercussions for failing to repress student-protected media. Click here to download the comprehensive list of bills being tracked by WLA over the 2018 Legislative session. The WLA Legislative Committee worked hard over the session to read bills and help narrow this list. Now comes the work of deciding the 2019 Legislative Priorities. Click here to view a weekly report of bills being tracked by the Legislative Committee. On February 6, 2019, librarians, trustees and library supporters will gather in Olympia to visit with legislators and share their stories about how libraries support the educational attainment levels of Washingtonians and contribute to the health of local economies. Children’s Internet Protection Act from ALA’s Office for Intellectual Freedom and Washington Office.